How does a single person combine his two favorite hobbies of caving and videography into one successful marketing career? Dave Socky of the Blue Ridge Southwest Film Office is a talented professional who knows how. He began caving seriously in 1974 and started filming his caving expeditions in 1986. Luckily for Socky, he was able to find a way to unite his two favorite passions in the world and to do it successfully. Not only does he explore and survey caves; he documents them and manages his own video production unit with help from his wife. Socky works out of Roanoke and each year helps the Blue Ridge Southwest Film Office host its annual film festival. 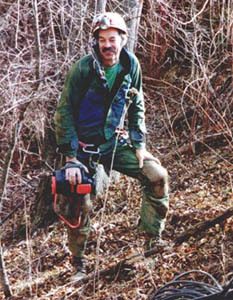 He also is an active member in the International Speleological Society Convention. The videos he has created are both fascinating and educational. Some of his videos are often sold at particular cave gift shops, such as The Grand Caverns, and some of them have been sold for use to mega-companies, such as National Geographic and The Weather Channel. Socky sat down recently with Planet Blacksburg to share his life experiences and techniques in film making and cave exploring. Q: How old are you and where are you originally from? Socky: I am 56-years-old and I am from Richland, Wash., and my dad worked for General Electric in Washington. He worked with the Hanford Plant where they worked with the atomic energy stuff. Q: Did that inspire you at all to get into caving? Socky: No, actually the only thing that inspired me to get into caving was that we used to go camping in the mountains all around Richland. My dad was a rock hound so we’d go into old mines and look for minerals and so forth in caves. I remember that from way back when and it spiked my interest in caving. Q: What caves are close to Southwest Virginia? Socky: Well, actually in Russell County, Washington County and Scott County there are hundreds and hundreds of caves. They are all over the place. We have DOM, which stands for Dirty Old Men, convention thing. It’s not what it sounds like. It’s where you get together over Thanksgiving in Lebanon and essentially go caving for just about a week or at least over Thanksgiving and do surveying. Spend all day going surveying and then partying in the evening and then surveying the next day. Q: Any reason why you began fiddling around with video production? Socky: Well, the primary reason why is because I was doing still photography for a while. A lot of people had cameras and a lot of people take pictures and in the National Speleological Society we have a convention yearly in different places in the United States. And they have a competition called Photo Salon and everybody shows their slides. It’s a big show, a big production. And you get first places, second place, third places, and so forth. And I entered a few pictures here and there but the competition is really stiff. There are a lot of people that do that particular competition. And I thought to myself that not a lot of people do video. Q: Have you always aspired to become a videographer just like you have aspired to be a cave explorer? Socky: Well, actually I think that caving came first and then photography and then videography. Before I got into caving I took pictures here and there but it was always more of a secondary thing than a primary thing. So the caving was more of an inspiration factor and stuff that helps. Q: I know you’re an electrical software engineer for General Electric, but what would you say, if you could do it all over again, would be your career of choice? Socky: Actually, I would be really interested into getting into the film production industry. Or maybe would be the technical end of hardware. Having to do the video with hardware, the Kodaks, the compression systems, and the software required to do that stuff. The technology that is involved, especially when you consider taking these little cell phones and streaming video on these things you know, they’ve got single little chips that do that stuff, its amazing. Q: Could you describe your involvement and experiences in the International Congress of Speleology? Socky: I primarily am doing the promotional video for that. I’m doing the long version right now and at the International Congress it’s even a bigger deal because it’s an international crowd plus we’re going to have the national speleology society convention is going to be there too. I have been involved with the production of the Photo Salon. In other words I haven’t seen the front side of the Photo Salon for five years because I’ve been backstage running the sound equipment and the video equipment and projectors and computers and so forth. At the conventions now they’re more of work conventions than playing conventions for me. I had to work at writing the script for the Grand Caverns part time. Q: Do you usually have the same teams that work with you or do you have your own personal team? Socky: It’s pretty much the same crowd of people but it changes now and then. I had a crowd of people that worked with the Grand Caverns. Q: Do you do most of the videotaping yourself or does your wife help you? Socky: Well, Mary Sue helps with the editing. But as far as the photography goes and videography goes she doesn’t really help that much. Q: What video cameras did you say you have? Socky: They’re both Sony. One is just older. It was wearing out. It wasn’t as good as it used to be. Your desire is for quality and truth. If I’m not happy with my picture now and I get this camera my picture quality will be better. And it does. But you get what you pay for. The video stuff is really true about getting what you pay for. Q: What kind of programs do you use on the computer for your editing? Socky: I use Adobe Printer pro for editing the video. And I use Photoshop for doing a lot of the still work. And I use Adobe Encore pro in the DVDs stuff and their audition for the audio stuff. I used to have, downstairs in my office, video editing appliances which essentially are computers that do nothing but video editing. It’s got a hard drive in the computer and a CPU unit and so forth. But all it does is editing. I have two of those downstairs. Q: When you’re videotaping how many sources of light do you usually have in order for you to tape inside a cave? Socky: I use lead acid gel cells. They’re like the big batteries that are used in the emergency lighting systems. About 12 volts. And then I use 70 watt, 60 watt quartz lights for power. They’re like the track lighting in houses. And they’ll throw out a flood. I usually use around three to six lights. That’s six to eight batteries. Each battery weighs about five pounds. That’s why you need help carrying them. Q: Do you ever get scared of cave-ins at all? Socky: I don’t really get scared. I get scared only if things shift around on you. But then you just become more cautious and careful. I’ve had instances where rocks have shifted and fallen down right next to me. Yeah that’s scary you know. But as far as entering a cave that you know that’s dangerous or unstable or vertical, no not really. Q: Are there any particular places that you would recommend for amateurs like me? Socky: The best thing to do for that is to get in touch with the parks and rec department in the county or city. They will supply all the equipment and they take you to a cave that’s safe. That’s probably the best way to do it as far as getting experience. Or if you are interested in caving get in touch with the Grotto and get to know some of the people and go to the meetings. Grotto is a caving club. Q: When and how did you begin your involvement with the Blue Ridge Southwest Virginia film office? Socky: They were having a film festival a few years ago and I actually contacted them as a resource to get to know people in the industry that knew about film and video so forth. I was trying to expand my horizons a little bit so I got involved with helping out the film festival and then they asked if I wanted to get on the board. That’s why my biography is on their website and so forth. Q: Do you get paid when they use your footage? Socky: Yeah, I got paid for that. It’s been used about four or five times or so. The Weather Channel used it for NOAA, the National Oceanic and Atmospheric Administration, for their piece on the dangers of flooding. It included gullies, rivers and storm drains but they did a short piece on caves and I shot part of the footage on that. That was more like 10 years ago and they used it more as an education piece. Q: Can you name some of the companies that you’ve sold your caving videos to? Socky: I actually distribute the caving videos to Inner Mountain Outfitters which is a caving vendor company which is based in Georgia. I also sell videos to Inter-realm books in Colorado and those were the two primary distributors that I used. Plus the Grand Caverns video I did I sold it to the gift shop. I probably have sold more of those than anything else. The selling of videos pays for my new material in order to create more. Q: How many videos have you produced and what made you start wanting to market to people? Socky: I’ve probably done about 15 or 20 videos or so. What got me going with selling stuff were the music videos. That was some of the first stuff I did that was worthy of selling. They were good enough that people would like to buy them and it was pretty cool to sell it to them. Most of the vendors that I sell through are personal friends of mine, caving videos and I asked them if I could sell my caving videos in their store and they said sure yeah so we worked up a deal. And people buy them, not a whole lot, but they still buy them. It was a way primarily to help relay some of the costs of the video. Q: What would you say is your proudest achievement? Socky: I guess the thing I like the most is the mapping and discoveries of Wolf River cave. That’s where the jaguar bones were found in Tennessee. That was back in the mid- 70s. Socky: Well, the International Congress of Speleology is the main one I’m working on right now. The one I’m going to commit to doing here soon probably is Cumberland Gap. The Cudjos Gap cave in Southwest Virginia. It’s up to 15 miles and is owned by the National Park and we have the Cave Research Foundation has an agreement with the “memorandum of understanding” because it’s really official. We’re doing a resurvey of the cave. I’m working with the project leaders and we’re thinking about doing a video for the gap. Q: How much longer do you think you and your wife will continue exploring caves? Socky: As long as my body will allow me. And then after that we are going to turn and do arm chair caving where you sit back and listen to stories from other people, go to meetings, watch programs and read books.